A glance over the bank at Boundary Creek put in revealed some color in the water after a night’s heavy rain. A gully washer upstream of the Middle Fork’s put in of Boundary Creek the night before our launch didn’t bring the river up, but it did wash a lot of ash from an old forest fire into the river. The unusual silt in the river made it a challenge to read the water where shallow rocks lurked invisibly just under the surface. With the challenges of those first 12 miles behind us, we settled into camp at Sheepeater Hot Springs. With a walk of about 300 yards from the kitchen, you can bet there was a hole lot of soaking going on! Nothing better than waking up in the hot springs with a cup of hot coffee in hand! Evening color at Sheepeater camp at the end of the day. Day two was the fourth of July and we were bound for Marble Camp. The river was still turbid but more channelized so it was easier to navigate. 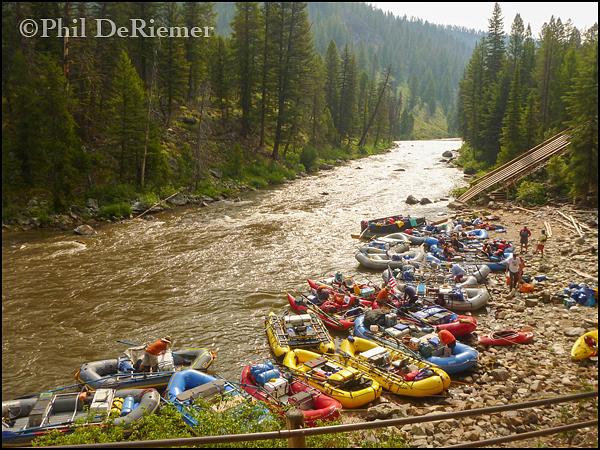 This stretch provides a good warm up leading down to Pistol Creek, the key rapid of the day. From there the rapids ease and it is a nice paddle to camp. Sweep boat driver and game master Zack B. ready for the fourth of July. Marble is home to one of the finest surf waves on the river. It’s nice to camp there because if you don’t have the energy to surf at the end of the day, there is always the next morning. We don’t always luck out and get Marble camp, but when we do, we make the most of it. The wave at Marble is, for many, their first high speed surf. Once established on the wave you feel as if the water is racing by at 60 mph. The challenge is getting on the wave. 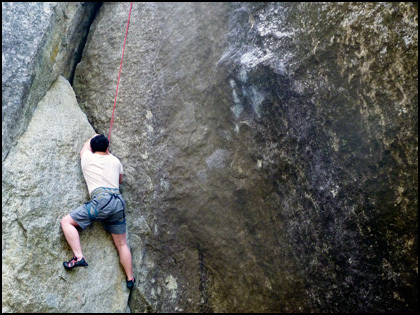 While there is a great eddy on river left to stage from, it is unforgiving if you are unable to scramble back into the eddy before you get washed downstream. Once below the wave it’s either a tricky ferry from the opposite side of the river, a carry back up above the wave or, if the level is right, a human rope tow whereby someone stands in the water and pulls people past a surge of water that guards the eddy. The water level was right and with one of us positioned on a submerged rock in the eddy itself, we were able to push people onto the wave if they needed an assist. Between a session in the evening and another long one the next morning, everyone was giving it a go, including a 72 year old Henry. What a surf!! 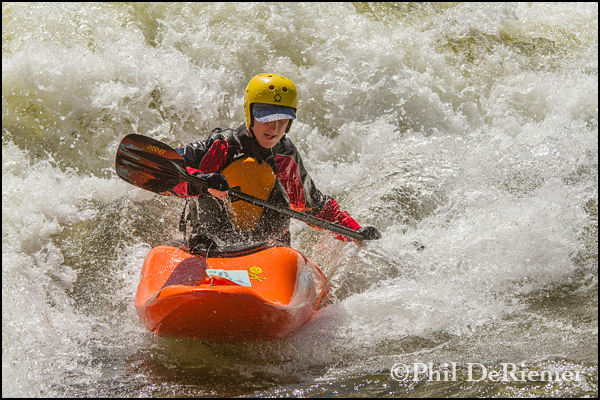 Normally guiding one of the rafts, Anika borrowed some gear and showed us how it was done. Rather than give a blow-by-blow account of the trip, I’ll let these photos tell the rest of the story. Lets just say this group was into having a good time, from playing and learning on the river to hoola-hooping in camp, we all had a lot of fun. Special thanks to the crew at ECHO who provided great support; Anika, Zack, Tessa, Colleen and Dewi plus Chris Lewis, our third kayak guide. Great fun everyone! 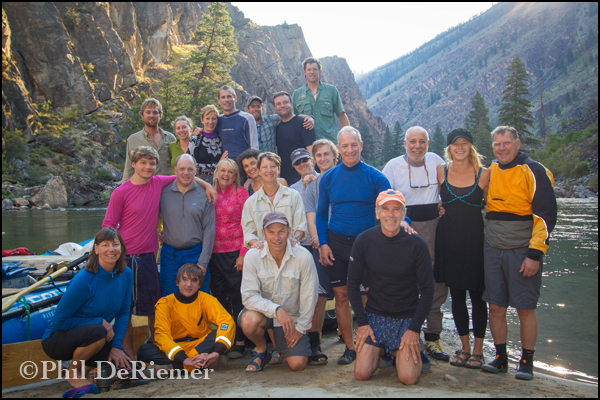 One big happy group on the Middle Fork. Steve gets some coaching before going to battle. The view looking back upstream at Rattlesnake cave. 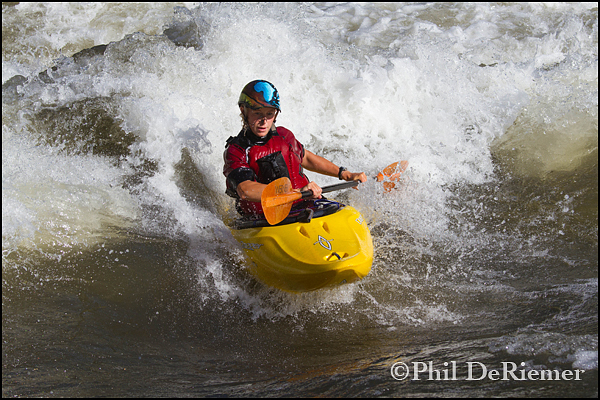 Kayakers in Pistol Creek rapid. Mary works on keeping her back surfing skills sharp. Somewhere in the Impassable Canyon. Jeff celebrates his victory over Hoola. Some of the great crew on the trip: Anika, Zack, Tessa and Colleen. The massage train leaving the station. Emily learning the hard way to beware when Phil says, “Want to try something fun”. Ready to load on day one Ed takes charge of the hoola hoops. Tristin ripping it up on the wave at Marble during an early morning surf. 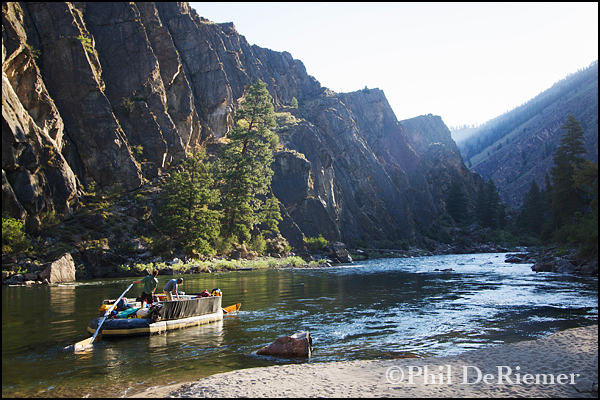 There were lot’s of familiar faces for our first trip of the season down the Middle Fork Salmon. Tom, who probably has more trips on the MF than Mary and myself combined, made the long drive from Texas, Arn and Deb as well as Jim S. arrived from Colorado, Jane, one of Mary’s old friends from NOC days, used the trip as an excuse to bring her busy kayaking family together from Maryland. California was well represented by Kurt, Tristin, Dave, Vicki, Pam and Bill K. Also from Cali was our adopted raft passenger Bill W. who has done numerous trips with ECHO over the years. Once he stumbled onto a trip of ours, he had such a good time he’s now a member of the tribe. Rounding out the trip and all the way from the flooded city of Calgary, Canada was Paul. For the first day and half we had a steady drizzle of rain and a stop at Trail Flat hot springs along the river’s edge gave temporary relief from the cold. Kayakers knocking down the chill of a rainy day with a soak in Trail Flat hot springs. By the afternoon of day 2 the clouds were breaking and the sun warmed our camp at Marble and shown a spotlight on the surfwave just below. 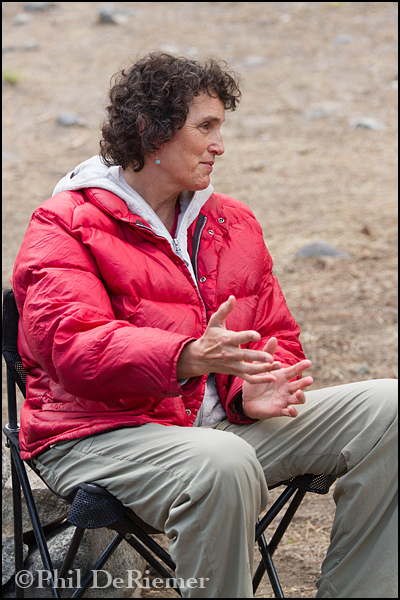 People took advantage of the sunshine to play frizbee golf & bacci ball, hike to a vista point behind camp or just sit and relax. 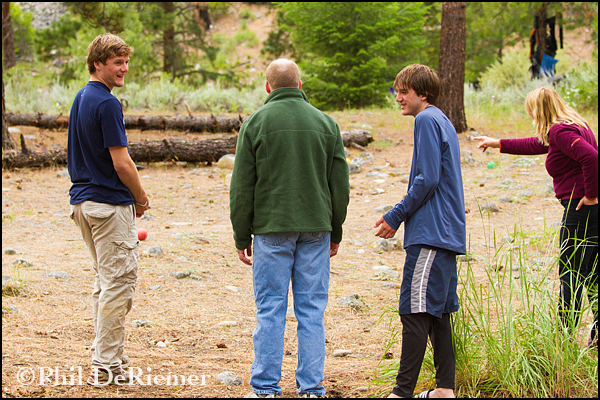 One tight family, Luke, Steve, Jack and Jane discuss strategy during a lively game of bacci ball. On day 3 the diehard surfers in the group enjoyed a morning surf session before paddling down to catch the rest of the group that were enjoying a soak at Sunflower hot springs. Luck had been with us on the assignment of camps and we scored Loon with one of the best hot springs on the entire trip just a mile up the creek. Loon Creek near it’s confluence with the Middle Fork. Paddling into camp late afternoon of day 4 we had covered just over twenty four miles that were packed with great whitewater and dramatic changes in the canyon’s character. We were camped amongst the Ponderosa pines at Survey camp. The margaritas had been out for an hour now and the guides had strung up a rope between trees and draped it with “dare wear”, a mix of thrift store costumes for all to wear should they decide to. I’m always surprised at who wears what, but hey, “what happens on the river, stays on the river”. Dressed up, seated in a circle, we listen intently as 16 year old Jack gave us his TED Talk (No kidding, to see the original talk, minus the costume, click here). Proof again that you never know what you’re going to learn on a river trip. Our many talented musicians played into the night with all of us enjoying one another’s company and conversation. No shortage of good conversation around camp. 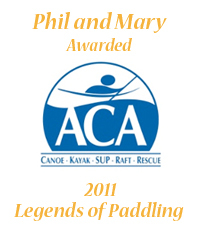 Our last two days we paddled through the Impassable Canyon, a name that speaks of the steep terrain. 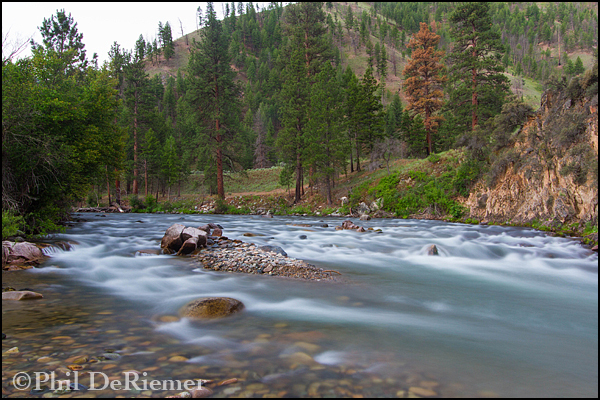 The river is by far the only way to navigate this rugged landscape. After an awesome morning of great rapids our final day, we confluenced with the Main then crashed through the mighty, Grand Canyon-style Kraemer rapid to reach the take-out. 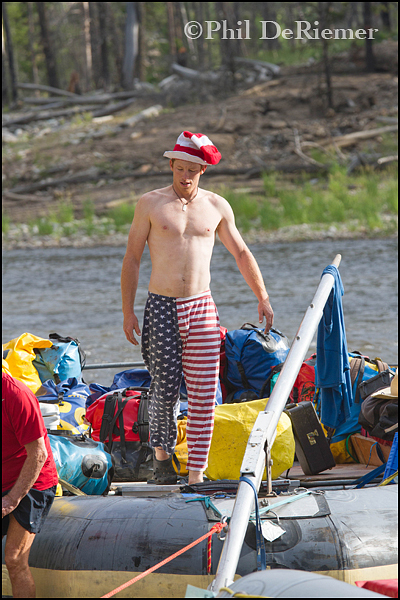 As Henry B says, “The Middle Fork trip references my whole year. 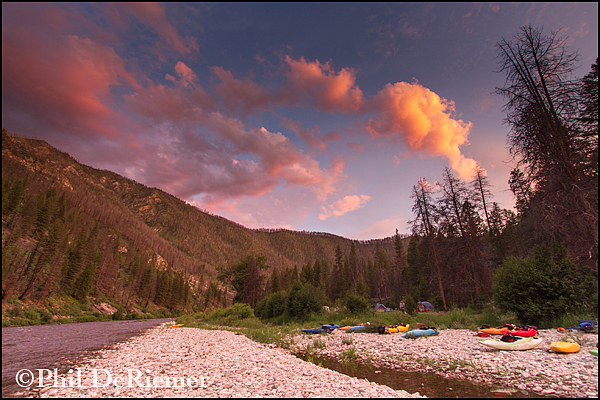 There’s what happens after the Middle Fork, and then, there’s what happens before the Middle Fork.” We hope many wonderful things happen in your lives before your next Middle Fork trip!! The sweep boat leaves camp early morning our last day in the Impassable Canyon. 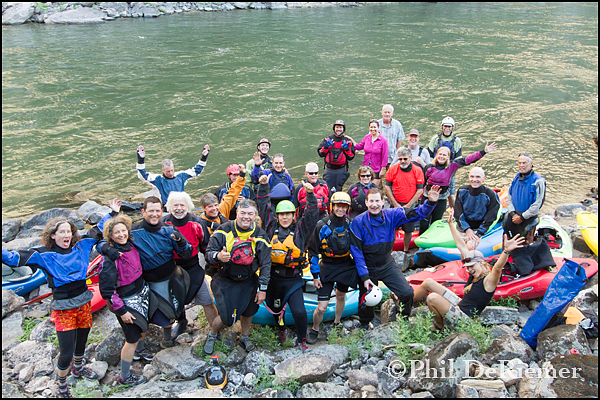 Thanks everyone for kicking off the Middle Fork season with us. The view looking out from under Veil Falls, a must visit side hike. Paul and Anika soak it in amongst the grotto at the base of veil falls. Steve A feeling the stoke of surfing at Marble wave. Andrew trying his luck in front of camp. Morning at Marble camp looking upstream. Jim S. puts his 4 fun to good use on Marble wave. The raft guides take advantage of a little down time before jumping in the kitchen to prep dinner. Father and son, Kurt and Tristin attempt the very difficult art of tandem relaxing in a pack raft. Colleen smiling and in the kitchen. 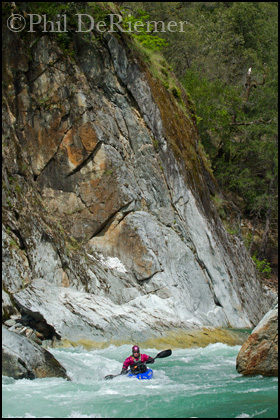 Raft guide John checks out the acoustics at Veil Falls. 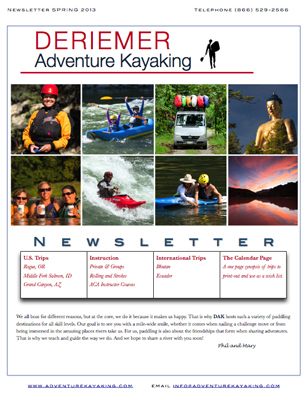 In October and November of this year we will be returning to Bhutan to lead two, 13-day kayaking adventures. In addition to paddling on Himalayan rivers we’ll take time out to visit monasteries and temples, hike the countryside and learn more about the culture of these gentle, gracious and fun loving people. Between now and our fall departure we’ll have regular postings featuring images and short stories about our past travels there. You can learn more about our trips by boofing over to our website or contact us directly. 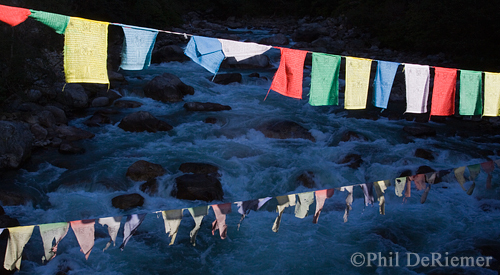 You’ll find these colorful panels of fabric slung across rivers, posted outside of dzongs and temples, in front of houses, at the top of mountain passes and in meadows. They can be a single color vertically tied to a tall pole, or a series of five individual colored panels joined together horizontally by a string. Their shape, color and positioning all have meaning. We westerners are probably most familiar with the string of five individual flags colored blue, white, red, green and yellow. Mary and I have a string of them over our porch as a reminder of our time spent in Bhutan. Each color represents an element; water, sky, fire, wood and earth. These are printed using wooden-block printing techniques. The print is a series of blessing which Buddhist believe are carried by the wind across the land and into bodies of water to further spread their benefit to all sentient beings. On ridge clearings you will sometimes see a cluster of vertical poles with long white flags lashed to them. These are erected to honor a deceased family member in order to guide them to the next life. When possible there will be as many as 108 of these vertical flags, a number of significance in the Buddhist religion. Atop these poles is a small wooden disk that represents the lotus blossom. From the disk extends the blade of a wooden dagger, signifying that the Buddhist teachings slice through ignorance and lead the way to enlightenment. Outside of monasteries, temples, dzongs and other important structures you will find the tallest of the flags. They are often white with red, blue, yellow and green colored ribbons sewn to them. The pole is topped by a metal or fabric parasol that is known as the victory banner. This too signifies Buddhisms triumph over ignorance and harmful behaviors. Most times an astrologer will determine the exact date for placement of the flags. He may also give instructions for the direction, location and color. The lightweight and loose weave of the fabric assures that they will soon begin to erode under the force of the elements, reminding us of the impermanence of all things. Buddhist or not, sitting on a mountain pass with the sound of the wind rippling across the surface of the flags, or seeing the play of light on the translucent fabric will pull you into the moment in a present and meditative way. This slideshow is just a teaser. We’re getting settled at home in California after a great kayaking season in Ecuador. 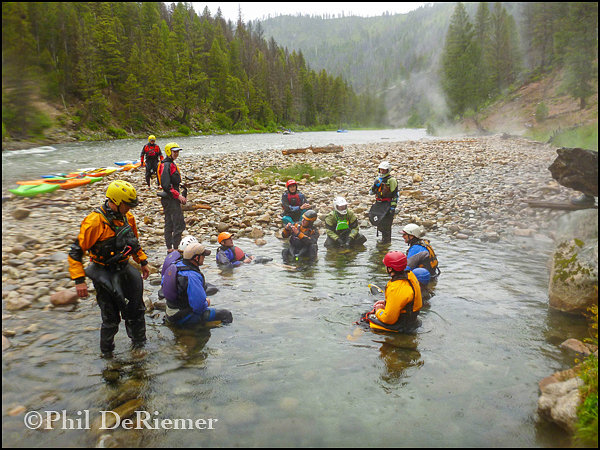 This past week saw us doing some teaching on a couple of our local rivers; the South and North Forks of the American. Easter weekend was spent kayaking and climbing, while cars with snowboards and skis on their roofs could be seen returning from the Sierra- all of this within and hour and a half of where we live. Paradise. 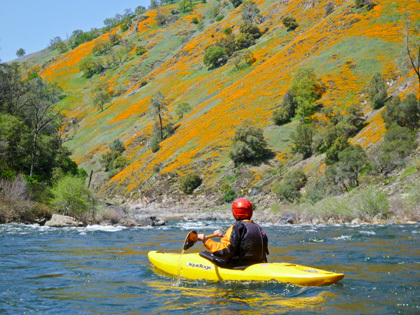 Enjoying the Poppies on the SF American River. Sunshine, clear water and amazing scenery on the North Fork of the American, CA. Working on the scouting skills. 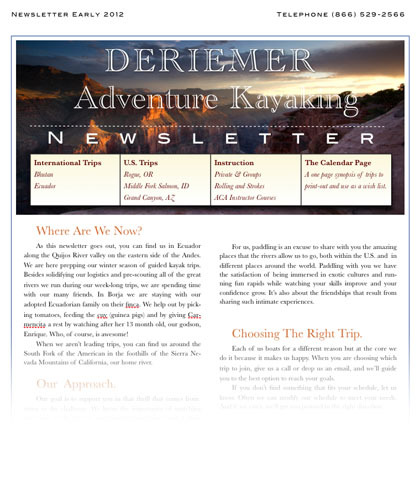 Boof on over to our homepage for a link to download our current newsletter and list of program offerings for the upcoming year including a return to Bhutan and a spring Grand Canyon trip.